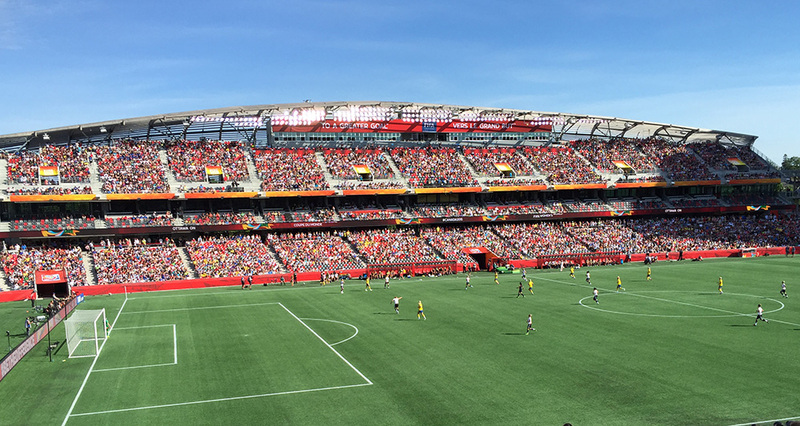 This summer’s Women’s World Cup (WWC) has showcased the premier female soccer players in the world and the best of Canadian sport and competition venues. Every match and round of the WWC has been held in premier stadiums and leading Canadian cities – it has proven a remarkable success for the entire nation. Building on that momentum, the WWC semifinals and championship match are hosted by three of Canada’s most historic and accomplished stadiums: Olympic Stadium in Montreal, Commonwealth Stadium in Edmonton and BC Place in Vancouver. Each of these venues has built a reputation for sports excellence by consistently hosting professional and international competitions. Still, the challenge of hosting WWC matches required each of these venues to adapt and evolve. Here’s a brief look at the history of these facilities, and the changes they made to help make the 2015 WWC a success. Originally built for the 1976 Montreal Summer Olympics, Olympic Stadium in Montreal (or the “Big O” as its often fondly called) has stood as a symbol of international sports and competition in Canada since its introduction. The venue has welcomed more than 67 million visitors to date and remains the only covered amphitheater in Quebec, with more than 56,000 seats. The stadium was designed by French architect Roger Tallibert and includes a large tower to supports its retractable roof. During the 1976 Olympics, the stadium hosted athletics competition and the opening and closing ceremonies. Olympic Stadium’s multipurpose design has allowed professional sports teams to use it since the games. Even with its history and successful track record of hosting these key events, Olympic Stadium needed to relocate its media and broadcast areas for the WWC and also invest in new signage to reflect the uniform image desired across all venues. Now home to the Canadian Football League’s (CFL) Edmonton Eskimos, Commonwealth Stadium opened in advance of the 1978 Commonwealth Games. Equipped with multipurpose functionality, the venue has hosted four Grey Cups, nine FIFA World Cup qualification matches, the 1996 CONCACAF Men’s Pre-Olympic Tournament, the 2002 FIFA U-19 Women’s World Championship and the 2007 FIFA U-20 World Cup. The venue can seat up to 60,000 fans for major events. Commonwealth Stadium recently underwent significant renovations and enhancements including the creation of a new field house, locker rooms and office space. The venue also added a community recreation center equipped with aquatic facilities and expanded fitness and training areas. Furthermore, after hosting the 2010 Grey Cup, Commonwealth Stadium replaced its outdated bench seating with new and wider seats that WWC fans have enjoyed this summer. The youngest of these three famous venues, BC Place opened in 1983 as a key component of the 1986 World Fair. The venue is now home to the CFL BC Lions and Major League Soccer Vancouver White Caps and has hosted key events including a 1984 papal visit, nine Grey Cups, NFL games, baseball games and the 2014 NHL Winter Classic. 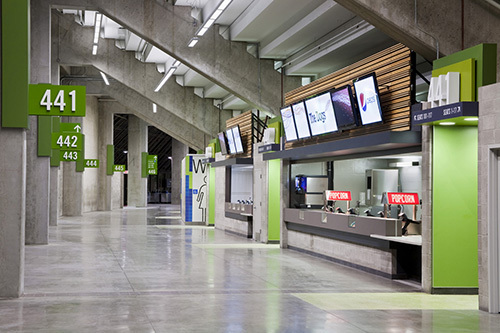 To prep for both the 2010 Vancouver Winter Olympic Games (it hosed opening and closing ceremonies) and now the Women’s World Cup, BC Place replaced its interior seating, added permanent turf, renovated its corporate suites and concourses and also introduced a brand new wayfinding and signage program. As the world tunes in to watch the final matches of the 2015 WWC this week, it will be taking a peek into three legendary sports venues that stand the test of time. These venues continue to help Canada shine thanks to consistent innovative thinking and strategic planning for the future.